The 80,000 square foot Children's Museum of Pittsburgh is based on the concept of letting kids "play with real stuff." Exhibits designed for babies, toddlers, older children, and even their parents encourage hands-on play while learning. 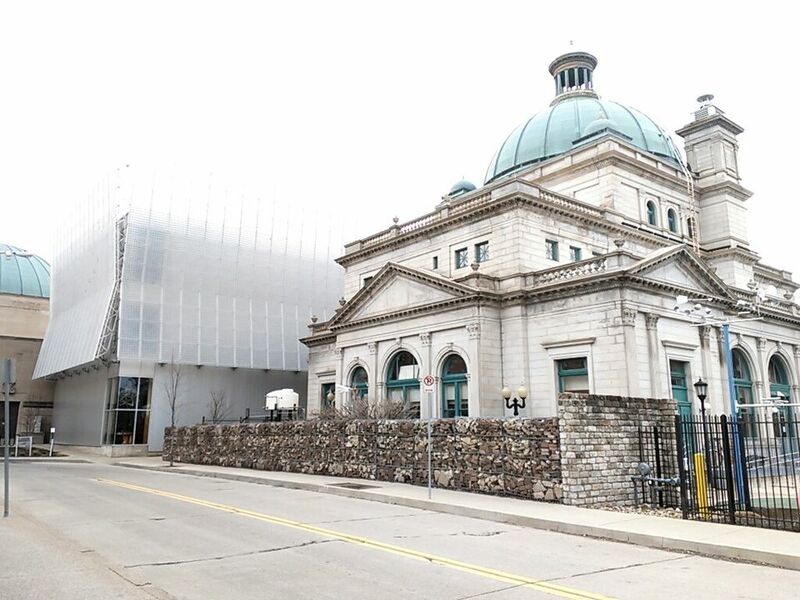 Located on Pittsburgh's North Side, the Children's Museum of Pittsburgh is housed in three connected buildings, the historic Allegheny Post Office (c. 1897), the Buhl Planetarium building (c. 1939) and the new Lantern Building (c. 2004), which joins the two. The exhibits at the Children's Museum of Pittsburgh are designed to fire a kid's imagination, challenge their abilities and teach them to understand the world they live in. The hands-on exhibits, both indoors and out, are designed to appeal to children of all ages, with special areas in each exhibit designed for babies and toddlers. You don't have to decide between taking the baby to one room and your older children somewhere else! Families can play together in every museum exhibit. You and your family can make a boat and send it into the rapids and whirlpools in Waterplay, try to keep your balance in the Gravity Room, visit Mister Roger's Neighborhood, get behind the wheel of a MINI Cooper car, learn how to build with wood and circuits in the Workshop, create silkscreen prints, paint, or sculpt with clay in the Multimedia Studio. A "backyard" exhibit adds some outdoor fun with water, rocks, and mud during warmer months. "Real stuff" classes and demonstrations at the museum include woodworking, simple machines, and clay sculpture. Musical movement and Tot Time classes are offered for children as young as 18 months. Birthday parties at the Children's Museum of Pittsburgh are always a favorite. A wide variety of themes accommodates children from ages 1 through 10. After an hour spent enjoying activities based on the theme of your choice, you get the second hour for lunch, cake and presents in the party room. All birthday party guests are welcome to stay and enjoy the museum after the party is over. It wouldn't be a museum without a gift shop, and the Children's Museum of Pittsburgh doesn't disappoint. The shop offers a wide selection of educational products and toys for children of all ages. Many of the items can be found in the exhibits or are designed to complement them. The Mister Rogers' Neighborhood puppets are a favorite item, along with arts and crafts materials. The Museum Café, located in the Grand Hall of the former Buhl Planetarium building, offers a wide variety of food items including sandwiches, burgers, salads, pizza, hot dogs, fruit, yogurt, cookies, coffee, and other soft drinks. There's a patio for outdoor seating in good weather, and the Café is open daily, closing one hour earlier than the normal museum hours. The Children's Museum of Pittsburgh is located in Allegheny Square in the North Side neighborhood of Pittsburgh. Check the official museum website for driving directions to the museum. Two museum parking lots are located just past the Children's Museum of Pittsburgh, with reduced rates for museum members. Metered parking is also available nearby. Discount exit tickets for the nearby Allegheny Center Garage, Gate 4, can be purchased at the Museum's admission desk. The garage is closed on weekends, and will not honor Children's Museum tickets during Pirates and Steelers games. Alternatively, you can also use public transportation to get to the museum. The Port Authority of Allegheny County (PAT) bus route 54C stops right in front of the Children's Museum of Pittsburgh. Other routes drop off nearby, including 16A, 16B, 16F and 500. For more information, visit the Port Authority of Allegheny County website. What Can You Do at the Pittsburgh Zoo? What CSA Programs Are Available in Pittsburgh?